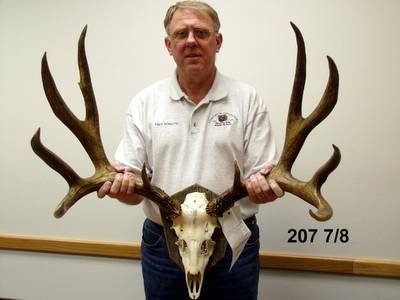 The deer in that picture is the current state record for a typical mule deer. He scores 207 7/8 by the Boone and Crockett scale. He was poached by a slob hunter. That critter was stolen. All poached animals are stolen from the rightful stewards - the people. With the general season opener this weekend, it seems prudent to remind everyone that while you may be alone in the woods, you still have a responsibility to hunt wisely and ethically. That means no drinking, no flock shooting, and no poaching. It's pretty simple. Do what you were taught in Hunter's Safety, or what you were taught by your elders. I don't know if you guys remember this great opinion piece from Nick Gevock over at the Montana Standard. If you haven't read it, you should. He speaks the truth about slob hunting. We've all witnessed bad behavior in the field. We've probably even done some stupid stuff that we'd rather not tell anyone about. Nobody is blameless, but everybody needs to be a part of the solution. That solution is calling out slobs when you find them in the field. Call them out them with the god's honest truth that they are doing more to ruin the image and the popularity of hunting that the folks who actually are trying to ruin the image of Hunters in the eyes of the American public. Right now, I'm supposed to be editing the last bits of the MWF newsletter, but instead I've been packing for Deer camp and watching On Your Own Adventures. I just watched Randy arrow a bull from 2 yards. It was pretty sweet. Randy had a bit in the episode where he quoted the God-Father of wildlife conservation, Aldo Leopold. Aldo once said “Ethical behavior is doing the right thing when no one else is watching- even when doing the wrong thing is legal.” Damn skippy. Remember that as you go out into the forests and fields. remember that every time you shoulder that weapon, and put the crosshairs on a critter, you are responsible for your life, that animals life, and the world's perception of what a hunter is. When you're out in the field, and you have the chance to represent all hunters to those who have a negative image of hunter conservationists, and hunting in general. The world is watching. Well said. As a former Game Warden, I know the power of peer pressure, for both good and bad. Some people need to be shamed into doing the right thing; others need a night in jail; fortunately the vast majority want to do the right thing and have the self-discipline to follow thru.